Before I begin, let me say that I realize how absurd it is that I'm about to write an entire page over highlighters (haha get it?). But by now you've probably heard about how law school is the place where highlighters go to die, so if you're an incoming 1L you might be stressing about them like I did. The truth is, what highlighters you'll need depends on your own personality. 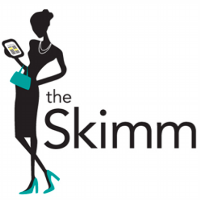 Keeping up with 10 highlighters not your style? Not in the mood to color-coordinate every. single. fact? That's fine, lots of people are like you too. I'd suggest getting see through highlighters. If I didn't go so overboard, this is what I'd get because I think being able to see where to stop highlighting would be a great feature. But, alas, I need a rainbow and these only come with 4 colors (which coincidentally gives you one color for each part of your IRAC). If you lose things easily, I have two suggestions for you. One is to buy two packs of regular highlighters. These are cheap so if you lose one, it's nbd to replace. Or you can get click highlighters if you're really bad at losing the lids, because a dried out highlighter is useless. There's also gel highlighters out there which I like because they can't dry out and are twisting. 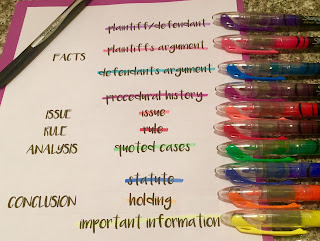 But I would only recommend using these on computer paper, because in my experience law books have a glossy coating on the pages which makes these rub off easily. If you're over the top like me, a multiple color pack is the way to go. I personally prefer this so that when you're called on to talk about a case, you can know the answer to your professor's questions just by looking at the case. My professor asks what the plaintiff argued, I know to scan for the pink and there's my answer. I'm currently obsessed with these highlighters because the colors are so vivid and pretty! Look, you know how you study and you know what you will and won't actually use. Get something like this writing essentials pack, and you're all set. On top of coming with every pen and pencil you'll need this fall, it also comes with 6 highlighters so you're basically done shopping for all of your writing utensils. Erasable highlighters are another that I would seriously contend if it came in more colors. No lie, there's been lots of times when I accidentally highlight the wrong thing and have to write JK! in the margins so I know to ignore the coloring. 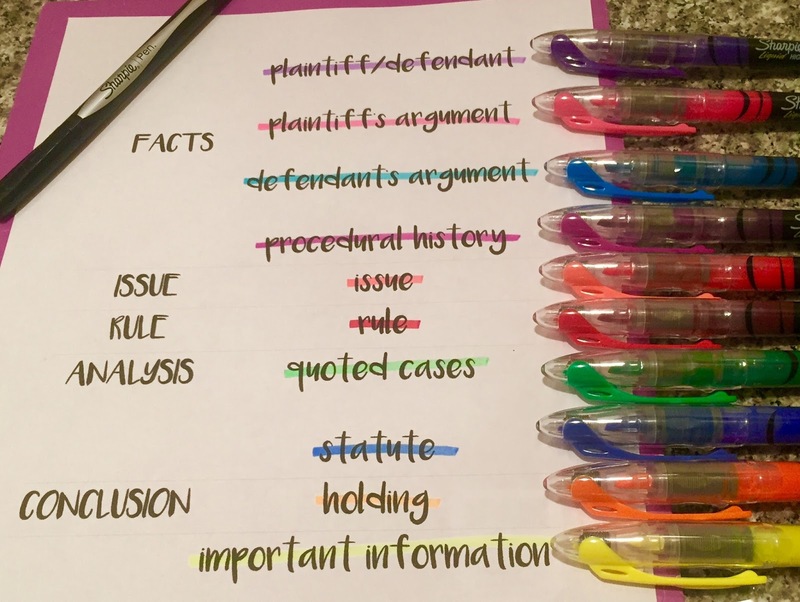 So when I saw my Moot Court partner do the same thing and then erase the highlighter, I freaked out! These rub off the highlighter and don't even smear! If you've ever seen an Insta-worthy photo of someone's study space, chances are you've seen these chunky highlighters laying on the table. Because I've seen everyone and their dog posting pictures with these, I'm assuming that they must be pretty good, so I'm considering trying them out. One new thing I've recently learned about are pencil highlighters which are really cool because they're made of wood instead of plastic so are they eco-friendly. You just use up your highlighter until it's sharpened into oblivion instead of having a big chunky plastic body to throw away when it's out. These also are a lot easier on your book than liquid highlighters. If you read through all this and you're still not sure what you'll want, then start out with this highlighter set. It comes with 6 narrow highlighters, 2 wide highlighters, 6 gel highlighters, 2 pencil highlighters, and highlighter tape! This way you can try out different types of highlighters (plus have 16 highlighters to start with) and see what you like. 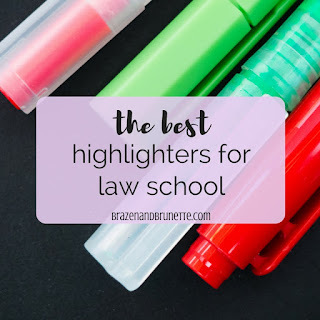 There's nothing fancy to say here, but if you are already feeling the weight of student loans on your shoulder, then just go really really cheap with some basic highlighters so you can afford toilet paper and bread this month. Whatever highlighter you end up using, just remember to use it as an aid and don't go overboard! If you're highlighting the text in between cases, it really shouldn't be more than about 2 sentences worth when combined per page. A good way to check yourself is to ask yourself if this is important enough to go in your outline—if not, then leave it alone! Another thing to keep in mind is try to come up with a system (like that ^) and stay consistent throughout your book and your other classes. How many highlighters can I have? The limit doesn't exist! SAME!! They're my favorite because they really do seem to last way longer than others plus I really like the color that they have versus the non-liquid highlighters!